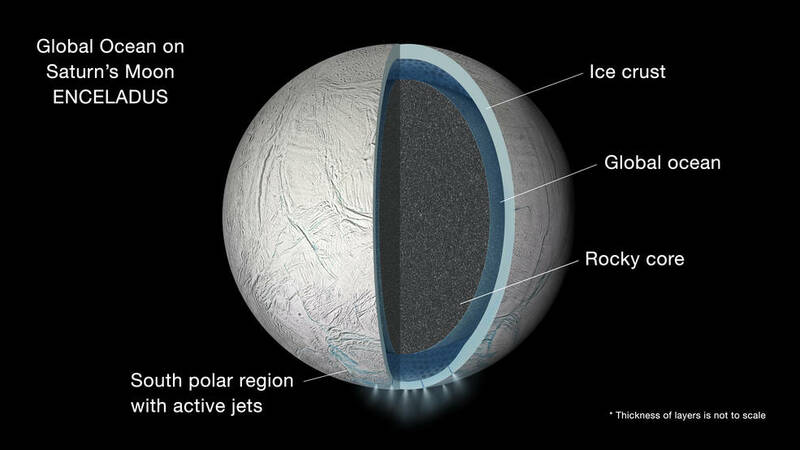 September 15, 2015 – A global ocean lies beneath the icy crust of Saturn’s geologically active moon Enceladus, according to new research using data from NASA’s Cassini mission. Cassini is scheduled to make a close flyby of Enceladus on October 28, in the mission’s deepest-ever dive through the moon’s active plume of icy material. The spacecraft will pass a mere 30 miles (49 kilometers) above the moon’s surface. The Cassini-Huygens mission is a cooperative project of NASA, ESA (European Space Agency) and the Italian Space Agency. NASA’s Jet Propulsion Laboratory (JPL) in Pasadena, California, manages the mission for the agency’s Science Mission Directorate in Washington. JPL is a division of the California Institute of Technology in Pasadena, California. The Cassini imaging operations center is based at Space Science Institute.